In the top left we have a Minolta Angle Finder Vn attached to a CANON 40D. This accessory viewing aid clips on the viewfinder window of all Minolta SLR cameras, Maxxum/Dynax, Sony Alpha as well as most CANON DSLR bodies. It rotates to permit viewing of the full screen image from any angle in a plane at right angles to the normal viewing direction. It also has variable (1x, 2x) image magnification along with adjustable diopter range of -9 to +3. It can also be attached to Konica Minolta Industrial meters by using Angle Finder Adapter which comes standard with the later production Konica Minolta Vn version. An angle finder is an absolute must for astronomical, macro or micro work and low angle shooting. This is a nice little bonus for vintage Minolta users who also shoot with Canon digital products. You can purchase a new Konica Minolta Angle Finder VN (Part No: 1807-701) from Tequipment.net for around $144.00. You can generally pick up a used CANON or Minolta Angle Finder on eBay for a good price. New CANON Angle Finder prices are in the $180.00 range. 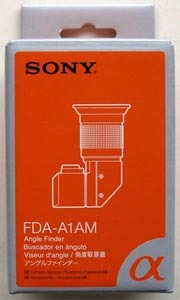 The Sony Alpha equivalent is the FDA-A1AM Angle Finder. 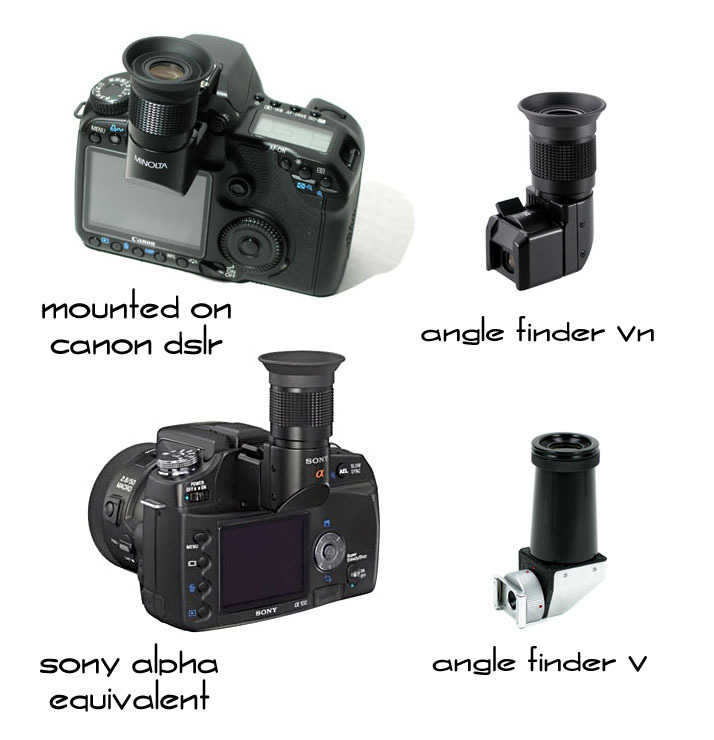 The Angle Finder V was introduced by Minolta for the early SR series. It has a fixed magnification unlike the Vn version, but does have an adjustable eyepiece that can be focused from -4.5 to +2.5 diopters so that either a near-sighted or far-sighted person may clearly view the image in the finder. And like the Vn version you can rotate the body to any position. You will not regret having one of these accessories in your camera bag.